Kitty String - Extra long kitty strings! Yo-yo tricks constantly evolve and so does the string that you use to learn them. Kitty String is a fantastic yo-yo string brand from the Philippines creating beautiful string from high quality materials. 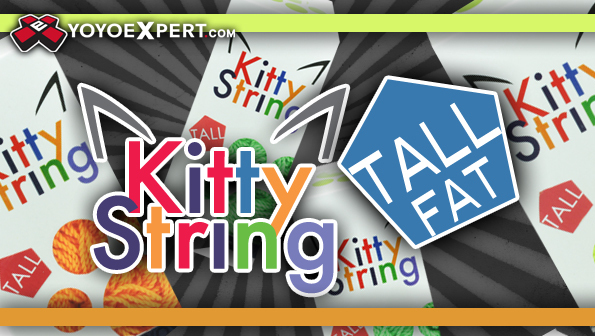 They offer a wide array of different string types in vibrant colors and this is their all new XL string! Kitty String Tall Fat is a longer version of the standard Fat Kitty String. It is made from the same soft polyester and twisted to the same thickness as your favorite Fat Kitty String. The added length of Tall Strings is ideal if you are getting into more complex body tricks or multiple slack tricks! You really can't go wrong with a longer string, you can cut it down and try different lengths until you get that "just right" feeling! Professionals around the world are beginning to choose Kitty String as their weapon of choice in competition - and for good reason - as far as yo-yo string goes it doesn't get much better than this!